The main feature of the design is the the two drive wheels. These serve several functions. They hold the rubber o-rings used to provide traction on the work piece. 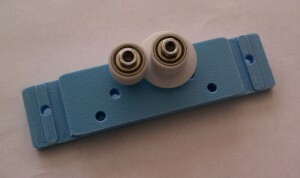 They have built in MXL drive pulleys and they have a spacer to ride directly on the bearings. These were 3D printed at Ponoko. With 3D printing, complexity is free. This encourages you to make the part do as many jobs as possible. I was initially concerned about the strength of these, but they turned out to be quite strong. I can probably reduce the material to take some cost out. I used the basic, cheapest, white flexible material. I was impressed with the detail level the material was able to hold. The belt fit perfectly. I started the design using convensional design techniques and off the shelf parts because I was concerned about the 3D printed part cost. I soon realized that it was going to take 3-4 separate parts to do the job of one 3D printed part. The cost was quickly getting close to even. The convensional parts were also starting to look a little mismatched. While I am a form follows function, type of designer, I am a big fan of a clean design. Once I started playing with the 3D printed part approach, I quickly decided that was the route to take. It was fun knowing that increaing the details on the part has no affect on the cost and in some cases actually reduces the cost. The spokes and radiuses retain the strength, reduce the material and I think add a retro mechanical design asthetic. Dealing with a single supplier, with a fast turn around and no minimum order, was very nice. I have done 3D printing from other vendors, but decided to give Ponoko a try on this part. Since this is an open source project, their online tools would allow others to easily order parts. At the other end of the assembly are the idler wheels. These also are Ponoko 3D printed items. They have bearings that press on each side. This allows them to roll freely with virtually no wobble. One idler has a flange on it. This acts as an end stop to the workpiece. It prevents it from “walking” while it is spinning. 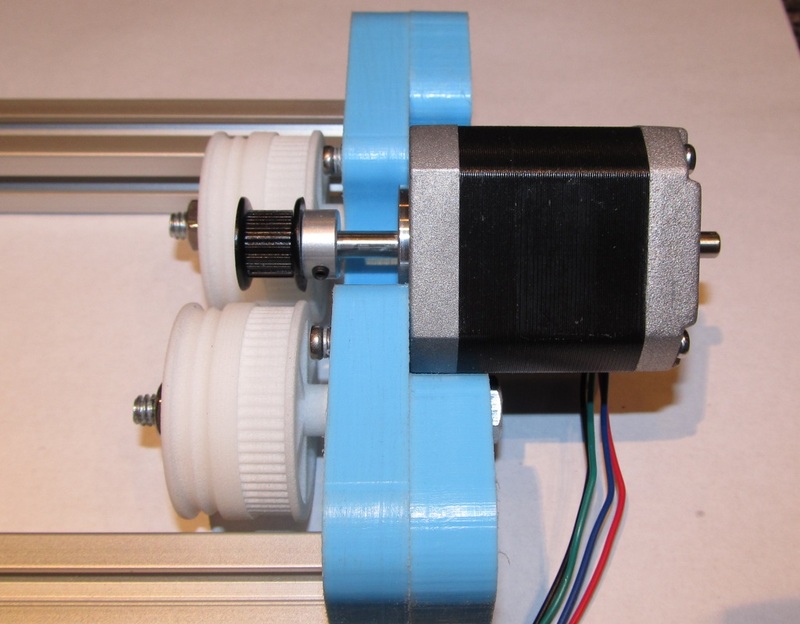 The stepper motor pulley serves the same function on the other end. This end is highly adjustable. 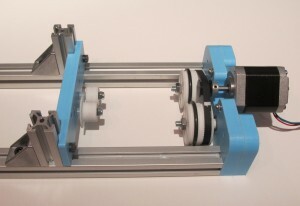 There are three positions the wheels can be placed in. The plate can slide on the extrusions and you can flip it over. While all the adjustments are manual, they only take a few seconds to do. Below is a video of some testing I did. I was trying to test a variety of shapes to see how they performed. In actual use the speed is very slow, because the the laser is primarily rastering along the length of the workpiece and this adapter just advances it a faction of millimeter at a time. They all performed quite well. The only item that did not test well was a roll of duct tape (not shown). It was not very round so it wobbled a bit. It also has a sticky edge so it did not ride against the stops real well. The screwdriver at the end is an interesting example. While it did spin smoothly, it shows that if the image is not going to be at the same diameter as the drive area, some image scaling will be required before engraving. The bit is only 1/8″ diameter! The design will be open source. There are a few tweaks to make before I release the drawings and 3D files. I may sell a complete kit for this. 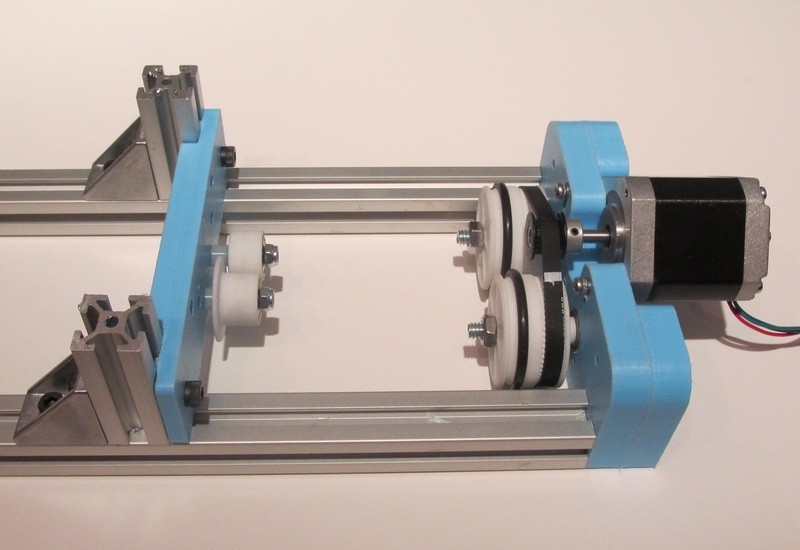 I estimate it will cost less than $100 with motor and extrusions included. I have not tested it in my laser yet. I don’t have the time right now, so I am going to have another 2.x laser owner do that for me….stay tuned for part 2. IS that 80/20 modular framing ? It is Misumi frame 20x20mm. I find the Misumi is considerably cheaper the 80/20. Is that no vibration when rotating and engraving? 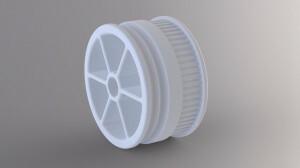 I’m very impressed with the quality of the drive wheels, but what material/ process was used? I can’t quite tell by looking at the finish. Hello I am wondering if the rotational unit kits are ready for sale, or if not are you selling the plans along with BOM. Please let me know I need two of them. The design is open source. The plans and BOM are free. I added links to the documentation at the end of the post. If you’re not going to do the kit, can I get your 3d files and have them made at Ponoko? I really like your design, but alas I’m a writer with minimal precision skills. And I would pay over a hundred for that kit…I think most of us would. You need to get something out of this. Sorry, I do not have plans to sell these any more. Hi again, I am going to try and replicate this as I realy like it, I have managed to order most part, but not the drive wheel and idler wheel as you had these made, do you think you could let me know how many teeth on these wheels. Those parts are available at Shapeways. Nice blog. Thanks for sharing . Its useful information regarding Rotational Engraving adapters. This entry is filed under Art, CAM, Digital Fabrication, DIY, Laser . You can follow any responses to this entry through RSS 2.0 . You can leave a response, or trackback from your own site.